During each of the twelve days of Christmas, the 1709 Blog is bringing readers some information concerning an author, composer, artist or creator who died in 1941 and whose works fall into the public domain in 2012 in countries which operate a "life plus seventy years" term for copyright in authors' works. Today the series features a giant of Indian culture and thought. For the first fifty-one years of his life, Rabindranath Tagore was relatively unknown. 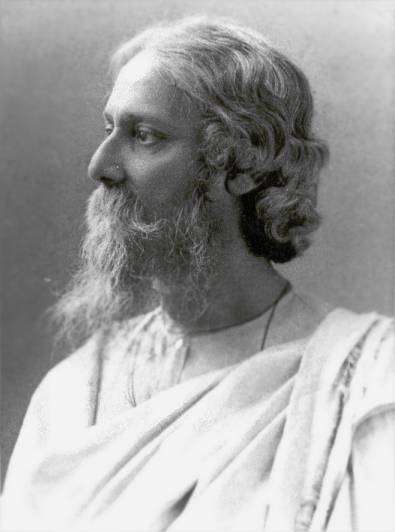 Apart from a failed attempt to study law in England, Tagore remained in his hometown of Calcutta and enjoyed limited success as a writer, philosopher and educator. His fortune changed in 1912 after travelling to England with his son. To fill time on the long journey, Tagore began translating his latest collection of poems, Gitanjali, into English. Upon arrival his only friend in England, the artist Sir William Rothenstein, was immensely impressed with these poems and showed them to his friend, the distinguished poet W.B. Yeats. Within a year Tagore had become an international literary sensation, and in 1913 went down in history as the first non-Westerner to receive the Nobel Prize for literature. Tagore devoted a great deal of his energies to promoting his ideals of harmony between different cultures, and in 1915 was knighted by King George V. Although Tagore tried to stay out of politics he later renounced this knighthood after the Amritsar massacre of 400 Indian demonstrators by British troops in 1919. The variety of Tagore’s creative output is a testament to the many interests and ideals to which he was devoted. In Bangladesh as well as India, Tagore is famous for having written the country’s national anthem; he also produced over a thousand poems, eight volumes of short stories, almost two dozen plays, eight novels, and countless books and essays on philosophy, religion, education and social issues. Tagore’s output of songs, exceeding two thousand in number, remain immensely popular in Bengal. The legacy of Tagore does not rest exclusively in the quality and quantity of his published works; the university he founded in 1918 (Visva Bharati, in East Bengal) aims to combine the finest teachings of Hindu culture with Western ideals, and was declared ‘an institute of national importance’ by the Indian Parliament after Tagore’s death in 1941.